At the risk of jumping the gun, I have to tell you about these. Every year as we approach May, I am tormented with choosing between two of my favorite adult beverages: margaritas and bourbon, well… anything. Why choose? Let’s just have both. That’s what I say. Though whoever thought it was a good idea to have the Kentucky Derby near Cinco de Mayo weekend clearly did not have a few nights in college where they combined tequila and bourbon. It wasn’t always my thing, but if you’ve been reading along then you know that my husband has a major thing for the Kentucky Derby and horse races. And if you haven’t been reading along, then… my husband has a major thing for the Kentucky Derby and horse races. Now you know. I’m pretty sure I recount my first mint julep experience every year around this time, how it was so strong that it stung my nose and my eyes but also was insanely delicious. And nearly knocked me out after a few sips. Are you allowed to put fruit in those things? Probably not. I most likely just committed a massive cocktail sin, but it should come as no surprise. There is a secret to this drink: it’s the crushed ice. You have to try it with the crushed iced. It has forever changed my stance on juleps. And I don’t have a fancy fridge that crushes it’s own ice… I simply threw cubes in the blender. I also don’t have a fancy blender like a Vitamix (would rather buy shoes, always), but I do have a slightly high-powdered Ninja blender from Target that did the trick. I fear that I’ve started to look at mint juleps as mojitos: the flavors are endless. Yeah yeah, I know the true, plain mint julep just has the bourbon and the mint and the syrup (omgsogood) but what if… it had blueberries too? I can’t even stand how delicious this was. I actually made it weeks ago then feared it was far too early to start talking about pretty horses and giant hats (mine would obviously be neon). It made for an excellent Monday cocktail, however. And now it’s going to make for an excellent Friday cocktail. You in? Now the real question is… can I wait ’til noon? now I am thinking of having a Derby party with hats required and this drink. and am alos reminded of a Blue Betty White I had about a year ago which was a G7t with blueberries. I need to remember where I had that …..
You had the Blue Betty White at Almond. It was crerated there by mixologist/ actress Eva Kriksciun. Wow. This sounds like a killer combination! I’ve got to try this soon! I want this right now. This just looks amazing. Those look amazing…must make for our KY Derby party! Always happy to find an excuse to use the mint that grows like weeds (are they?) in my garden! This looks so refreshing and fruity! 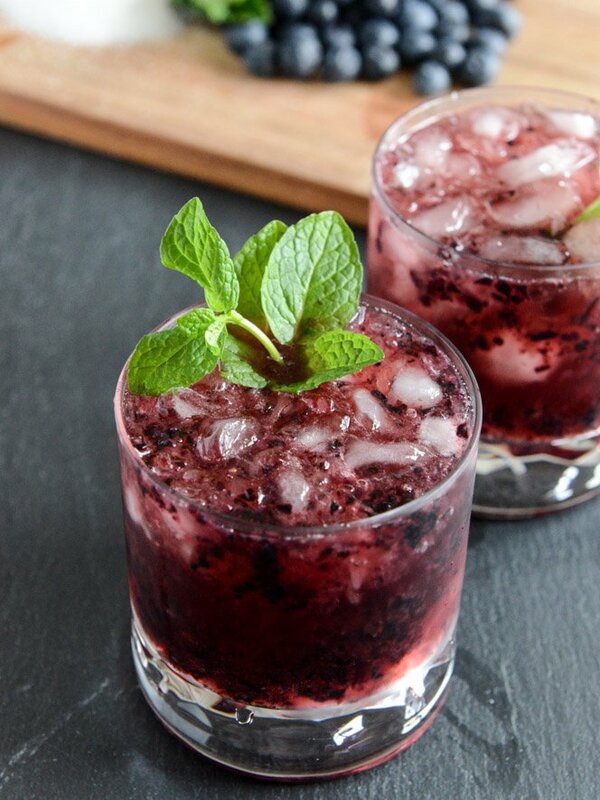 now this kind of julep i would love…the photo of the mint & blueberries is just so pretty. I’m so making these tonight as a “test run” for Cinco de Mayo, which is still weeks away. Then I’ll proceed to make it again, you know… To really try and get the taste just right. Then I’ll decide I should really just build my tolerance and make it EVERY SINGLE NIGHT until Cinco de Mayo. Yup. Sounds good. I absolutely adore your recipes. I am usually a food cynic meaning i am too picky, but these of yours are all so tempting. Cant wait to try all the booze. This is very tempting drink. Photos are really awesome.I have Indian mint drink version on my blog,hope you will like it. Pingback: Derby Day: #WickedStrong Mint Juleps | mayde good. Pingback: Top 10 Patriotic Drink Recipes for a Festive Celebration!